It’s Monday and, it’s me, Beatrice, back on the blog to inspire you with layouts featuring SnickerdoodleDesigns’ new collection Spring-A-Ling. Spring-A-Ling is currently available as part of The Hatchery exclusively at The Digichick. For images of the individual parts of the collection, as well as the story behind it, please see Karen’s March 4th blog post. Today I plan to show you an assortment of pages so you get an idea of the variety that can be found in the collection. 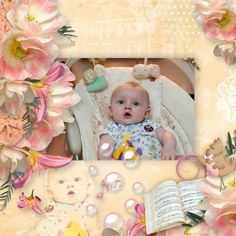 I love the darling photos in Beautiful by Rochelle86. The layout design is very creative and I especially like the photo crops from the child’s head down to her cute yellow boots! I like the background paper she created by blending the solid and the striped papers. Adding the border helps the eye move across the page to the edge. The cluster she created is gorgeous. I always love it when hand-drawn and realistic elements are combined together. 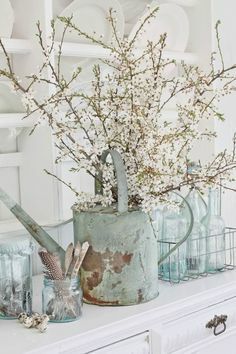 Spring- it-on is a simple yet stunning page by 6grand. I like the way she tucked the rainbow and paint behind her photo. I notice the subtle colors of the umbrella so I’m guessing she may have added the rainbow on top of the photo as well. The thin, orange border really makes the blue in the main paper stand out. Her clusters on both ends of the photo add to the horizontal design. Her title finishes things off just right. I love the play on words! The cascade of photos in Scotty Cooper Park R by msbrad, mimics the progress of the child’s ride down the slide. I really like the way she masked the large photo and added the sun on top to create a scene. Her cluster down the right hand side mimics the cascade of photos. Adding the additional photos in the bottom corner, topped with another darling cluster adds to her unique design. I like the way she added the word art from the collection in the center of her page to serve as her title. 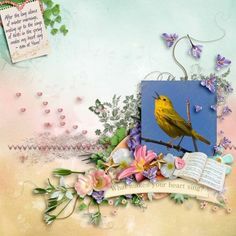 I love the picture created by Zanthia in Spring-a Ling. She chose the perfect background for her little scene with clouds and sun high in the sky and bees and butterflies moving about. The grassy border grounds the cluster to the right, which shows both a bit of fantasy along with a few realistic elements. Even though the little girl is enclosed in a frame she appears to be right at home on the page. There is always something so appealing about a photo taken from behind as in Glee by Kabra. I love all the stacked papers and the way some are tilted behind the photo. This layout artist always creates the most gorgeous clusters and typically keeps the elements large. The title is the perfect choice for the photo. I’ve come to the end of my post but before I depart I want to make sure you grab the freebie found on the March 4th blog post in case you missed it. Simply click on the image to download the gorgeous cluster created by Yobeth.